Got back last night from doing some filming on a cruise ship in the Mediterranean. I spent 8 days on the Island Star which left from Majorca and visited Sicily, Italy, Corsica, Sardinia and Menorca, before returning back to Palma yesterday morning. Basically we were shooting as much as we could on the ship for them to use for promotion, such as travel agents, the website and also for TV travel channels. It was pretty intense – we were doing 12-14 hour days, and didn’t really get much of a break all week, but it was enjoyable, if very tiring! It didn’t help that people on board kept commenting on what a great holiday we must have been having! Quick recap of the week: our flight from Manchester was delayed because of storms in the south of England, but we eventually got onto the ship in Palma by about 8pm. 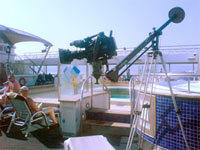 Then on the Sunday we had a day at sea and started work filming various stuff around the different parts of the ship. Monday saw us arrive in Palermo, Sicily, and me and Sparky jumped off first thing to see if there were any good views looking back from the port. However, it was quite industrial, so we actually spend a lot of the day shooting interviews with the captain and crew. We also used a mini-jib to get some nice shots in the Guest Relations area – it was the first time I’d used one, so was a little apprehensive about operating it, but it worked a treat! Tuesday was Rome day where over two thirds of the passengers got off to visit the sights, so we made good use of the ship being quiet to get some nice shots of the pool area (at all the other times it was very busy, and not quite the image we wanted to portray!) We set up the jib over the jacuzzi and the pool, and by the time we’d got some of the ship’s dancers to pretend to be holiday makers, it made it look really inviting with sweeps across the deck making it look really spacious! The next day we were in Ajaccio, Corsica, and we arranged to get some shots of the ship out at sea, which of course meant that we’d have to be on a small boat filming it. We got onto the ship’s emergency tender (which is a really small boat which they use if someone was to fall overboard etc) and headed out of the harbour to go out a few miles and wait for the ship to pass us on the open waters. However, it was a little bit choppy, and we were struggling to keep the shot steady. Basically, me and Sparky were sitting cross-legged on the fibre-glass roof of the tender, with nothing really to hold onto, just resting the cameras on our laps to try and get the required shot. The ship eventually came out and we were able to get some nice shots as it passed us – and then it came to a stop where we were to do a circle of the ship, and then we were to pull alongside to get back on. For some reason thought, the tender’s engine stalled and we were suddenly just sitting there not able to move! And the main problem with that is that when you’re moving, you’re cutting through the waves a bit so the boat is relatively stable. But, with us being stationary, it started to rock violently and we were both desperately trying to hold onto the kit, and stop ourselves being thrown off the roof! Also we weren’t wearing life-jackets because they would get in the way of the cameras, so if we had been thrown off, we’d have been in quite a lot of trouble. After a few minutes, they managed to get the engine re-started and we were able to get alongside the ship and climb back aboard. Thursday morning we arrived in Alghero, Sardinia, and I headed ashore with Claire (from Island Cruises) to film a mountain bike trek from the harbour to a beach further along the coast. Obviously we could cycle along with them because of our kit, so we had a taxi (with a non-English-speaking driver!) to take us to various points along their route so we could get some nice shots. It was boiling hot, but we did get to see some really nice parts of the island. To be honest, if I was to ever go on a holiday like this, I’d much prefer to do something like the cycling than staying onboard or going on coach excursions, because you actually get to experience the places much more closely. Then the last place we visited was Mahon in Menorca, and it really was a beautiful city. The view as we docked was really nice, and we went into town to get some great shots of the ship from various vantage points. Then in the evening we managed to get a few hours off, and got to eat in the Steak House, and the food was really good! 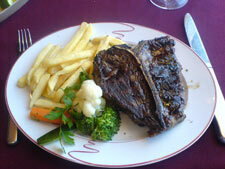 I had a T-bone steak with chips, and it was massive, and was really tender as well! The picture doesn’t really do it justice! I’m going to need to do so much exercise to make up for the meals I’ve eaten this last week! It was really hot the entire week, which isn’t one of the best working conditions when lugging around a load of camera kit! But it was really good, even though I’m incredibly tired now! 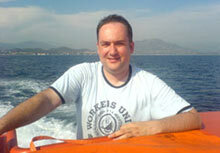 And I’ve managed to get a little bit of a tan as well! Check out the photos I took on my phone here. Bit of a gap since my last blog, so had better write one now! It’s been really busy with work. Me and James got the first Preview DVD completed in time (just!) and the response to it’s been really positive which is good. Now we’ve got to start thinking about how we’re going to do the next one!! On Thursday I saw Jamie for the first time in about a year which was a bit weird. Good weird though I think. He was at a mountain bike shop in Cheadle whilst on his lunch break, so popped in briefly before heading off on a site visit. Like I said, the last time I saw him was a year ago at James and Helen’s wedding, though we chatted online back in November, and I was kind of worried it’d be really awkward, but it wasn’t too bad considering. I think we’re going to arrange to go out on a bike ride together when he’s got a free weekend sometime. Then on Friday, I helped James move a tonne of stuff into his and Helen’s new house in Levenshulme. Helen was off on her sponsored bike-ride to Paris, and everyone else from Manchester was up in the North East at Helen Mason’s wedding. Their house is really nice – it’s the kind of house I wouldn’t mind having some day. It was so hot though – not ideal for moving furniture and boxes around, but we got it done, and grabbed takeaway and a DVD in the evening. And last night I was over in Ramsbottom (middle-of-nowhere, north of Manchester!) for Rob Hallam’s birthday barbeque. Didn’t know too many people there other than Rob (although Ajay and Martin were also there)… though I did recognise one of the guests even though he was out of his normal costume – Kenny Baker, aka R2D2 from Star Wars!